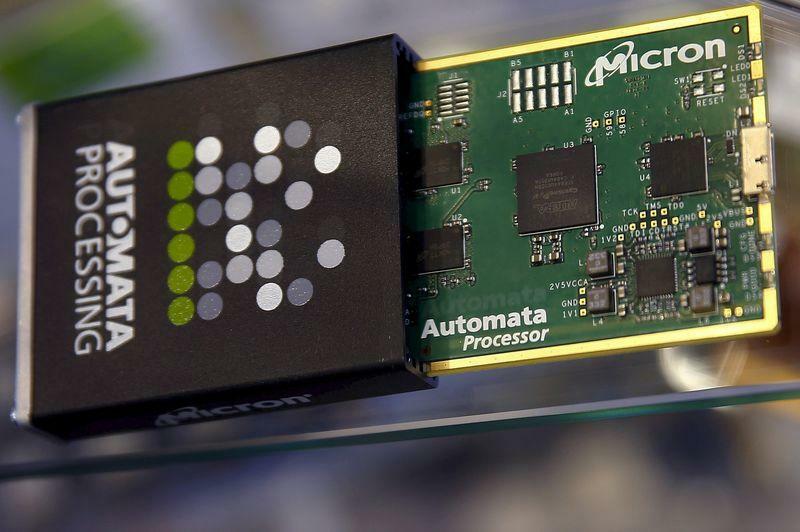 Memory chip parts of U.S. memory chip maker MicronTechnology are pictured at their booth at an industrial fair in Frankfurt, Germany, in this July 14, 2015, file photo. (Reuters) - Micron Technology Inc forecast a surprise loss for the second quarter, as the memory chipmaker struggles with weak demand for chips used in personal computers and lower average selling prices. The estimate of its first loss in more than two years sent the company's shares down 5.7 percent to $13.78 in extended trading on Tuesday. Micron, which makes DRAM and NAND flash memory chips, forecast a loss of 5-12 cents per share and revenue of $2.9 billion-$3.2 billion for the current quarter ending March 5. Analysts on average were expecting a profit of 22 cents and revenue of $3.46 billion, according to Thomson Reuters I/B/E/S. "We have a perfect storm going on here," Wedbush Securities analyst Betsy Van Hees said. "We have a seasonal weak quarter. We have weaker-than-expected end-market demand. We have pricing headwinds," she said. Micron, which competes with Samsung Electronics Co Ltd and SK Hynix Inc, has been investing to ramp up production of its higher-margin 20 nm DRAM chips and develop more efficient and cost-effective 3D NAND chips. Micron earlier this month agreed to buy the remaining interest in Taiwanese chipmaker Inotera Memories Inc in a $3.2 billion deal. NAND flash memory chips are widely used in smartphones, cameras and other mobile devices to store music, pictures and other data, while DRAM chips are mostly used in personal computers. "Overall, our revenues were impacted by declining pricing particularly in the PC DRAM segment," Chief Financial Officer Ernie Maddock said in a conference call. Research firm Gartner Inc said worldwide shipments of personal computers fell 7.7 percent to 73.7 million units in the third quarter, adding that the Windows 10 launch had minimal impact on shipments as users chose to upgrade to Windows 10 on existing PCs. Net income attributable to Micron fell to $206 million, or 19 cents per share, in the quarter ended Dec. 3, from $1 billion, or 84 cents per share, a year earlier. Excluding items, the company earned 24 cents per share, beating analysts' average estimate of 23 cents, according to Thomson Reuters I/B/E/S. Net sales fell 26.7 percent to $3.35 billion, missing the average analyst estimate of $3.46 billion. Up to Tuesday's close, Micron's shares had fallen about 58 percent this year.